The future hates complacency. It hates complacency so much so that it has built-in self-sabotaging mechanisms to continually hold our feet to the fire. It will not allow us to shift into neutral. If we are not moving forward, we are moving backwards. There is no middle ground. People are at their best when they are challenged. If we don’t challenge ourselves, the future has a way of giving us challenges anyway. There is great value in our struggles and human nature has shown us that we only tend to value the things we struggle to achieve. Yes, I understand this sounds a bit abstract, but bear with me. Our need for future accomplishments will also create a need for better systems to regulate, manage, and leverage the activities surrounding them. These systems will need to be global in nature, and over time, a few will emerge to challenge the power of nations. That time is coming very soon. For decades the ringing of the bell marked the opening and closing of each day on the New York Stock Exchange. This symbolic beginning and ending of the workday had set the pace for business in the US. To many, work only seemed to mattered when the money people were watching. However, that all changed once the Internet gave day-traders the ability to manage accounts around the world on the Tokyo, Honk Kong, Indian, Athens, and London stock exchanges. Start and stop times suddenly became blurred, and eventually went away. The metronome of business began to pulse to a different beat, and the once distinct start and stop times of Wall Street ended, it created a stream of never-ending business opportunities. This ever quickening pace of business has given strategists a whole new playbook, which has, in turn, forced companies to devise new systems and strategies to not only give them a competitive edge, but in the process, trump the competition. Government, on the other hand, has virtually no competition, and consequentially, little motivation to innovate. Like a lumbering elephant alongside the sleek cat-like speed of business, government has done little to keep pace with change, and even less to experiment, innovate, and improve. Our governmental systems are evolving at speeds that are exponentially slower than the businesses that use them. People in government are synchronized to a radically different clock. They are neither driven to compete nor incentivized to reinvent themselves. With their change-resistant inertia firmly anchored in the past, internal government systems have grown increasingly dysfunctional, sparking a growing voice of discontent among business veterans. Deteriorating education, increasingly expensive healthcare, a legal system with an unfathomable number of laws, seemingly corrupt financial institutions, incomprehensible tax codes, and an adversarial attitude toward change have all paved the way for a new breed of governing entities to emerge. The original idea for FedEx came when Fred Smith wrote a term paper as an undergraduate at Yale about a very simple observation: As society automated, as people began to put computers in banks to cancel checks, and people began to put sophisticated electronics in airplanes, the corporate world was going to need a completely different logistics system. Fred was working as a charter pilot at the Tweed New Haven Airport flying to various airports in the New England states talking to pilots who worked for many of the high-tech companies like IBM and Xerox and found out what a difficult proposition it was to keep their field-service engineers and their parts and logistics systems operating. Many of the corporate airplanes had to be repurposed to fly computer and machine parts around whenever something broke down. Several years later, after a stint in the Marines, Fred revisited the problem and found out that things had become significantly worse. Emery Air Freight was trying to solve the exact same problem, but was trying to use an infrastructure built around passenger planes, which weren’t designed to handle freight. So they were force-fitting the rapid movement of high-value-added and high-technology products into a transportation system that wasn’t designed for it. So FedEx was proposed as a customized system to solve this problem. To do this they had to have a nationwide clearinghouse – an integrated system with trucks and planes to give the level of service that customers needed. For their network, they used the Federal Reserve Bank clearing house system, where all payments converge on a central location to complete the transaction, as their model. And that’s where the Federal Express name came from. Fred wanted something that sounded substantial and nationwide, and American Express had already been taken. It was all made possible when the government began to deregulate the airline industry. Prior to that time, both surface and air transportation was erroneously based on linear routes, with complicated systems for making connections. It all came together during 1977-78 when the airlines were deregulated. A couple years later in 1980, the US federal government deregulated interstate transportation. Because the Postal Service had a monopoly on delivering mail, document delivery wasn’t allowed from a legal standpoint until 1978. The standards changed in 1978 as to what constituted an item that was covered by the postal monopoly. Merrill Lynche and a few others waged an ongoing assault through lobbyists and the press, telling Congress that the USPS service was not acceptable. At the time, Merrill was being hamstrung in its efforts to move bond “Blue Books” and other types of financial prospectuses. Bowing under the pressure, congress exempted certain types of publications and documents from the postal monopoly in legislation called the Private Express Statutes. As long as a company was delivering something overnight, and charged twice as much as the First Class postage stamps, then it was exempt from the Postal monopoly. So that defined the business FedEx went into. Backed with venture capital funding amounting to $91 million, along with another $4 million that Fred Smith had personally received as an inheritance, FedEx started out with 14 planes, initially flying between 25 cities. In 1985 FedEx began regularly scheduled flights to Europe, adding service to Japan in 1988, the Middle East in 1989, and the rest of the world in 1991. In just 18 years FedEx had become a global delivery system, not unlike many of our other global systems, most of which took centuries to develop. Global systems are a fascinating area of study because they provide a context so few ever consider. When we look at early systems such as written communications with Phoenician cuneiform, Mayan numerals, or the systems that had to be in place for engineering and building the Egyptian pyramids, it’s easy to see that system thinking has been around a long time. But global systems are a more recent innovation. Similarly, when a company who has had to make painful arrangements for the delivery of goods from the other side of the world can begin working with FedEx who provides painless global delivery, the company suddenly has time to focus on other critical problems. 1. Global Trade – In 1264 when Marco Polo traveled the fabled “Silk Road” from Europe to what is now Beijing, China, he made some of the first inroads into creating a system for global trade. 2. Global Sea Transportation – On the evening of August 3, 1492, Columbus set sail under the Spanish flag from Palos, Spain with three ships on his journey to America. This historic journey triggered an age of exploration, but more importantly gave rise to a new era of global sea transportation system. 3. Global Measurement System – In his 1670 book, the Observationes diametrorum solis et lunae apparentium, French scientist Gabriel Mouton proposed the basis for what would later become the metric system. Mouton described a decimal system of measurement based on the circumference of the Earth, creating a global measurement system recognized (although not fully adopted) by countries around the world. 4. Global News Service – While the telegraph was still in the early stages of development, in 1848 Paul Reuter founded the Reuters News Agency using carrier pigeons to provide the missing link between Berlin and Paris. The carrier pigeons were much faster than the post train, giving Reuter faster access to stock news from the Paris stock exchange. In 1851, the carrier pigeons were retired with the installation of a direct telegraph line. Paul Reuters played a critical role in the development of today’s global news services. 5. Global Time Zones – In October 1884, at the request of U.S. President Chester A. Arthur, the International Meridian Conference was held in Washington, D.C. to form the basis for times and time zones around the world. Twenty-five countries were represented by 41 delegates to establish what has become today’s global time zone system. 6. Global Air Transportation – Charles Lindbergh, better known as “Lucky Lindy,” became famous for completing the first solo, non-stop flight across the Atlantic, from Roosevelt Field, Long Island, to Paris in 1927 in the “Spirit of St. Louis.” This single act ushered in the age of global air transportation. 7. Global Navigation System – Launched in 1978, the GPS system serves as a Global Navigation Satellite System utilizing a constellation of 24 medium Earth orbit satellites that transmit precise microwave signals enabling a GPS receiver to determine its location, speed and direction. 8. The Internet – In 1989 Tim Berners-Lee developed the Internet protocols that would become the World Wide Web, as a hypermedia initiative for global information sharing while at CERN, the European Particle Physics Laboratory in Switzerland. He wrote the first web client and server in 1990. His specifications of URIs, HTTP and HTML were refined as Web technology spread. While these are just a sampling of the global systems that now exist, many more are on their way. In fact, the Internet has become the perfect platform for global systems to be designed, tested, and flourish. Here are some examples of global systems that are currently emerging online. I think it is safe to say that none of these were started with the intention of becoming “global systems,” but in the DNA of their business structures, they now exist as global systems in the making. Pay close attention to the nature of this list. We have just made the transition from top-down organizational structures to bottom-up organic systems that are participant driven and constantly evolving. The driving force behind developing new global systems is that each one represents a multi-billion dollar opportunity. Yes, in addition to making life easier, they make great economic sense. The next wave of global systems, however, will not be run by corporations, but rather by a new breed of what I call Experimental Nation States, governmental-like entities that experiment with new ways for managing the world. Future global systems will emerge from today’s existing industry associations. Many already have members living in multiple countries, and many seek to balance their decision-making councils with representation from each member country. Many of these organizations already exist on some level. But over time, the organizations that manage global systems will grow in influence and authority and begin to usurp the power of nations. As an example, WIPO, the World Intellectual Property Organization is responsible for bridging the chasm between existing intellectual property laws that exist in nations around the world. Even with WIPO in place there are huge problems with competing rules, laws, and standards in the world of patents, trademarks, and copyrights. If we start with the vision that sometime in the future, a person will be able to file a patent and it will be universally recognized and honored around the world, the natural question becomes, who will that organization be and what will it take for them to achieve that level of clout and authority? By its very nature, any global system aspiring for power will become a threat to existing national organizations. The evolution of global systems will involve countless hard fought battles against their current member base. Even though the need for global systems will be billed as a solution for the bias, fraud, and self interest found in current national systems, it will be more complicated than that. In some cases, the corruption and self-interest inside global leadership teams will be greater than the corruption inside the country systems they’re intended to represent. This is simply the nature of this type of authority. Defining moments will occur when the global organizations begin to challenge the authority of their national counterparts. In some cases the organizations will be set up as e-democracies with members voting on every key issue. If you think into the future, 100 years from now, what will be the most powerful entities in the world? Will it still be nations like the U.S. or will it be something else? As an example, will it be possible that corporate CEO’s have far more power and control than leaders of individual countries? Will religious organizations, wielding their international clout, begin to usurp the authority of their host nations? Will groupings of countries such as the European Union, OPEC, and the UN supersede the power of their member states? Will non-governmental organizations such as the International Monetary Fund, the World Bank, and perhaps even ICANN rise in influence to a point where they can usurp the authority of individual countries? Will the economic ties of large professional organizations, such as IEEE (Institute of Electrical and Electronics Engineers – currently with 365,000 members worldwide), transcend the authority of the countries where their members live? In the past, the power of a nation was considered the ability to defeat an enemy and protect its own people. But power today is more about the ability to influence and control others, even though a few still cling to the notion that it’s about defeating the enemy on the battlefield. In the future, a few dominant countries will continue to serve as the global police to quash uprisings and resolve disputes. But as communication systems improve, we will see fewer and fewer willing to openly wage war with an enemy. Most of the power shifts between now and 2050 will result from subversive economic battles, and the ability to control or disrupt revenue streams. For the disruptors, the tools for creating chaos are becoming more destructive, and soon a single individual with the right kind of gear will be able to shut down, perhaps even destroy, an entire nation. The power centers of the future will be the countries with systems most adept at competing in the global marketplace. Large countries like China, Russia, Brazil, India, Japan, England, and USA will still play major roles, but smaller countries will have a distinct advantage with their ability to quickly adapt and experiment with new approaches. So how does all this play out? 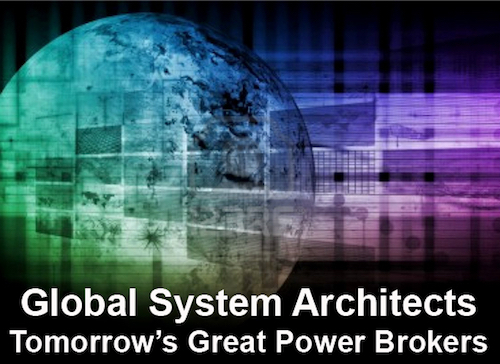 My prediction is that global system architects will emerge as some of the dominant power brokers of the future, and those who recognize this shift will begin to position themselves in way to take advantage of it. A few enlightened people have already recognized this shift and the change is already beginning to happen.